First of all this week I should like to thank those who have been in touch about when the Tudors and Stuarts History Weekend details will be up on the Centre’s webpages. The first week in August is a pretty quiet time at universities generally because the early summer academic conference season is over and doesn’t start up again until the beginning of September. For those who were at the Centre’s first event of the new academic year, a joint occasion where the Centre was in partnership with the Agricultural Museum, Brook, they experienced a great treat when Dr John Bulaitis give the Nightingale Memorial Lecture. As those who have read earlier blogposts will know, John was due to talk about ‘the battle of the ducks’, and these 56 Indian Runners, not your average farmyard fowl, were very much in evidence, but so were a bull, a sow and sundry other agricultural items, including a hayrick, as well as the inventor of bar billiards. What is particularly striking about the ‘Tithe War’ of the 1930s is that this is still within living memory for some; indeed tithe itself was not fully abolished until 1977, so this is not some archaic practice lost in the mists of time, but still resonates today. In fact among the audience on Friday were men whose fathers and grandfathers had been on opposite sides of the proverbial barricades during the ‘tithe war’. Those directly involved in the ‘liberation’ of the ducks and the returning of them to their ‘rightful’ pond at Beechbrook Farm in Westwell had begun their campaign when between 70 and a 100 people, mostly young men and some with trucks, had congregated at the ‘Half-Way House’ on the Dover Road. This was not far from Shepherdswell where the ducks had been taken on the orders of the Ecclesiastical Commissioners to their farm called West Court Farm, run by their tenant. The ducks and other livestock had been seized because the farmer at Westwell, the Rev. Roderick Kedward, had refused as a matter of principle to pay the tithes demanded of him. Reports about this night-time raid in September 1934 were reported in the national press the following day, making the Church authorities even more furious. They thus sent their agents, General Dealers, to retake the ducks, and the other items that had not been collected during the first sequestration, and also persuaded the Police to provide a substantial guard at West Court Farm for the whole of the following week. The Ecclesiastical Commissioners’ policy of seizing goods in lieu of tithe payments required them or their agents to turn the goods into cash, and initially the means used for the latter was to auction them off. Yet following several very public debacles (Ruckinge and Stelling Minnis in September 1931) where those sympathetic to those refusing to pay tithes put up ridiculously high bids and otherwise disrupted the auction process, the authorities turned to alternative methods – public tender using the services of possession men, and hence the ducks’ episode. Just from the names of the places mentioned so far it is clear that these anti-tithe farmers came from different parts of Kent, and there were certain ‘hot spots’ in the county, namely the areas around Sandwich and north of Dover, the Weald and the Romney Marshes. Such areas were not that far from earlier centres of discontent, as at Barham Downs in May 1834 when about 3000 people met to denounce the evils inflicted by tithe, or again in the early 1880s when the Sevenoaks Chronicle reported in 1883 that support for tithe protestors was especially strong in the Weald. Indeed, Mr Cooper is still known as the Smarden martyr having been sentenced to a month’s hard labour at Maidstone jail for his actions again the Church authorities. Furthermore, Dr Paula Simpson found evidence of such resistance in the 16th century, and even before the Reformation during the later Middle Ages. Equally, it is also roughly the same foci where these earlier tithe disputes were at their greatest, and such a geographical pattern similarly has something in common with first areas of Lollardy and later non-conformity. Not that Kent was the only place in the British Isles where tithe was bitterly contested and in the modern period, as John said, other places included Wessex, Sussex, East Anglia, and interestingly Wales. Again, as he suggested, we need to think about issues surrounding non-conformity and also nationalism (and/or an anti-London feeling in the form of seeing the capital as remote and urban, unable to understand rural society). Thus, John provided a perceptive analysis of the place of tithe disputes as part of the social and cultural contexts of resistance and rebellion in the English countryside, before turning to the immediate conditions that were important in the problems of the inter-war years. He discussed these under 4 themes: the major changes in land ownership after the Great War when tenant farmers bought farms, paying ‘over the odds’ which necessitated large mortgages; the post Great War legacy of tithe payment levels that were pegged at what had become unrealistically high levels, which was coupled by a move to centralised collection of tithe through offices at Westminster Abbey; the new agricultural depression of the late 1920s and into the 1930s; and finally the activities of an increasingly militant group known as the National Tithepayers Association. Towards the end of his lecture John spent some time discussing the important leaders of this Association. In particular he considered the strategic contribution of Frank R. Allen, who, having worked for the Dean and Chapter at Canterbury Cathedral in the collection of tithes, knew many of the farmers personally, the difficulties they were experiencing, and, for his later role, had an insider’s knowledge of exactly how the system worked. He seemingly changed sides as a consequence of a particularly nasty dispute with the Dean in 1924, which amongst other things cost him his pension. Other important individuals were the Rev. Kedwood we met earlier as the owner of the ducks, Kinglsley Dykes, a father and son: George and David Gill, Ebenezer Haffenden and Alderman Solley of Sandwich. While not going into details here, the important issue is that such men advocated a wide range of political views – from fascist to communist – but were bound together in their common hatred of what they saw as an out-dated system that exploited the rural community mercilessly. Yet, as John reported, sadly so far modern historians have failed to appreciate the significance of this political movement in the countryside. In part this is a consequence of an almost total focus on urban society, and even where such matters as the Tolpuddle Martyrs or the Swing Riots have been discussed, tithe has either been ignored or seen as ‘curious’ or ‘amusing’, rather than giving it due weight as an important political and social phenomenon – something John is in the process of correcting. As last week I want to let you know about matters involving those attached to the Centre, and in this instance I want to highlight the value of working collaboratively with other organisations in Kent. The first involves the rescheduled lecture by Christ Church’s Dr John Bulaitis on the tithe ‘wars’ of the early 1930s. This talk comes under the umbrella of the Fourth Nightingale Memorial Lecture where the Centre has teamed up with the Agricultural Museum Brook, which holds these talks as a way of honouring Michael Nightingale’s vital contribution towards the setting up of the Museum. For in addition to the collection of mainly Kentish agricultural machinery and tools predominantly from the 19th and early 20th centuries, the Museum comprises two fantastic buildings. Firstly, there is the Grade I listed barn which was an essential component of the manorial complex in the Middle Ages. For those of you who know Brook this will not come as a surprise, and those who have visited this little village near Wye will also know about the lovely parish church with its fantastic wall paintings and upper room. Completing the medieval complex is the manor house that at one time was the home of the Principal of Wye College and is now a private residence. For the non-medievalists, and also a fascinating building in its own right, is the Museum’s second historical building, an oast house which is an early example of the round type. Consequently it is hardly surprising that the Museum’s Trustees believe it is important to remember Michael Nightingale’s contribution, and it is excellent that his son John Nightingale continues the family’s connection, especially as he is an eminent historian based in Oxford. 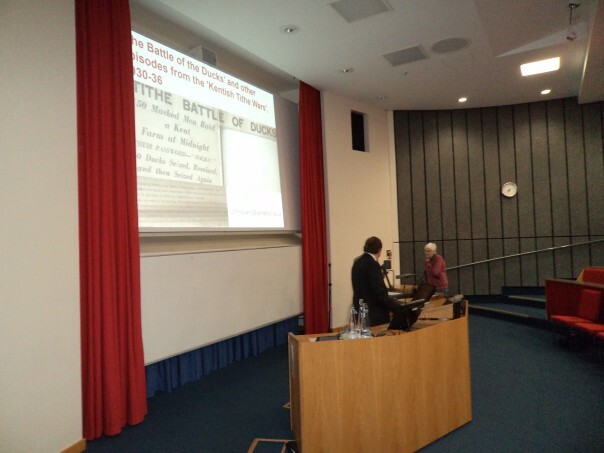 So as one for your diary: do come and hear John Bulaitis’ lecture ‘The Battle of the Ducks’, which will take place on Friday 2 October at 7.30pm (wine reception from 7.00pm) at Old Sessions House, Canterbury Christ Church University. My second involves the wearing of multiple hats, metaphorically that is because I don’t like hats! As some of you may know today is the beginning of the National Festival of Archaeology fortnight. To mark the start Maidstone Museum held a family-friendly day to introduce everyone to various aspects of archaeology in the county. The Museum is an excellent location because not only does it have an important and interesting collection of artefacts, but it also houses the library or meeting room of Kent Archaeological Society. The Society has strong connections to the Centre at Christ Church, including through the Society’s President Ian Coulson, but also I have served on the Society’s Council for several years. Consequently I was representing both KAS and the Centre when I joined Pernille Richards, the Society’s Hon. Librarian, after lunch in the Society’s library. In the morning Mike Clinch had given a talk on underground Kent – dene holes and the like, and we had decided to contrast this with a much more hands-on session in the afternoon. Lots of Magna Carta activities have focused on the making of seals which meant we needed something different, and finding that the Museum has a badge-making machine was extremely helpful. Now for a medievalist the obvious badges are those pilgrims got when they had been to a particular shrine or image, and of the places of pilgrimage in medieval Kent the most obvious is Canterbury. 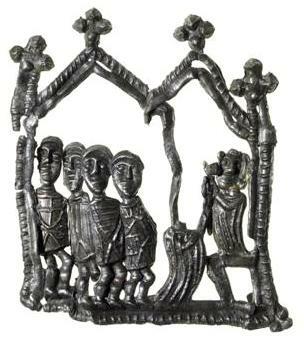 Thus our activity was pilgrim badge making, and specifically badges that denote St Thomas of Canterbury. In the later Middle Ages such badges were often made of pewter, although some were probably lead and up-market ones were silver. Most of our information about such badges comes from the many examples that have been found, often in or near rivers, although these must represent the tip of the proverbial iceberg in terms of the total numbers made over the medieval period. It has been found that at particular important and popular shrines about 100,000 badges may have been sold to pilgrims each year. However the badges themselves are not the only sources. For Canterbury we do have the wills of a father and son badge-making business from the early 16th century and the Prologue of The Tale of Beryn (takes Chaucer’s Pilgrims into Canterbury and the cathedral) also talks about (stealing) badges. Thus the thirty or so children and parents in Maidstone today pretended they had been on pilgrimage to Canterbury because we talked briefly about whose shrine we would have been to in the Middle Ages, what it looked like, why we might have gone, and, most importantly, what sort of badge we might have chosen to mark the completion of our ‘pilgrimage’. We looked at the simple ones which show St Thomas in his archiepiscopal vestments with his mitre, before moving on to look at badges that show episodes in Thomas’ life: his exile – on board a ship still wearing his mitre; and his death at the hands of the knights while a monk looks on. This surprisingly graphic depiction was contrasted to a badge that just had a sword and shield – emblematic of Thomas’ martyr’s death. These latter two badges were very popular, perhaps because we had more boys than girls, but we did also have some takers for the ship too. We also looked at a badge representing the shrine and then those showing ampullae, which are likely to have held a few drops of liquid – purporting to be the watered-down blood of St Thomas and hence having the potential for contemporaries of conferring healing powers to believers. The Canterbury bell was not popular, which again reflects the desire for a badge that portrays action in some form or other. We had a pretty constant stream of badge-makers throughout the afternoon and, just like their medieval forebears, they went away proudly wearing their badges. Moreover by denoting their achievement, the early badge makers this afternoon seem to have helped to advertise the session, bringing in more recruits to try their hand at cutting out, sticking and colouring their chosen creation. This activity may seem a very simple introduction to archaeology (and history), but hopefully it is such days that will inspire the next generation of diggers and researchers. In addition, it is probably worth remembering that the skills involved in these two subjects are not only important for historians and archaeologists but can be transferred to many career paths. Consequently this was an enjoyable and worthwhile afternoon.